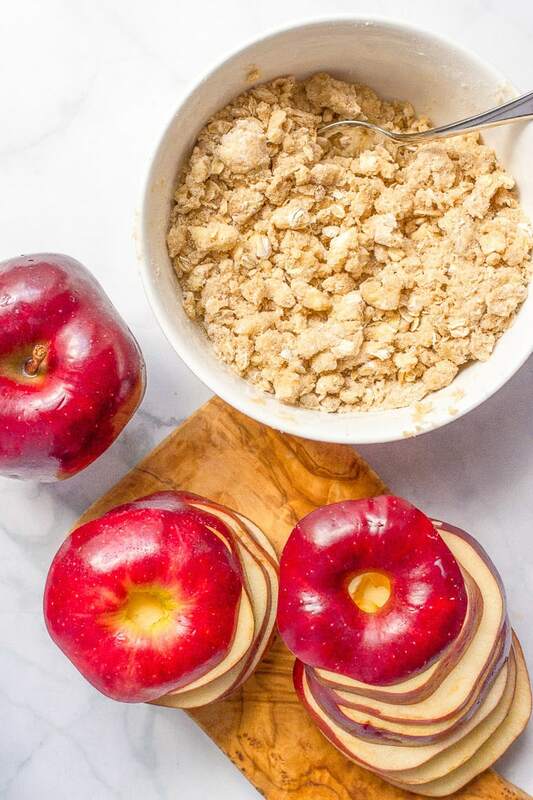 Easy healthy apple crisp stacks are a fun twist on a dessert favorite, and it’s ready in about 30 minutes! So confession: I’m not an apple pie person. I was a junior in high school before I ever even had apple pie. So, my high school math teacher found out I’d never had apple pie — long back-story there, so just go with it — and she decided to make me one. Because hers was amazing. And it was. It was delicious! I’ll never be able to eat a short-cut apple pie after knowing how good the real thing is. But still, I wasn’t really a convert. You’ll never see me order apple pie at a restaurant and I just can’t get that excited about it, even in the fall when I’m ALL about apple everything. But an apple crisp? That calls to me. I love any kind of crisp, really. 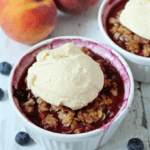 I make a delicious individual peach and blueberry crumble in the summertime with the fresh fruit and we literally cannot get enough. So for my ALL-APPLES-ALL-FALL tribute we’ve been having here on the blog — check out my homemade applesauce with fruit add-ins, my sautéed chicken and apples with rosemary and my easy slow cooker apple butter with no sugar added — I knew I had to make an apple version of one of my favorite desserts. But I also wanted to get a little creative with it, make it a little more interesting, a little more fun. 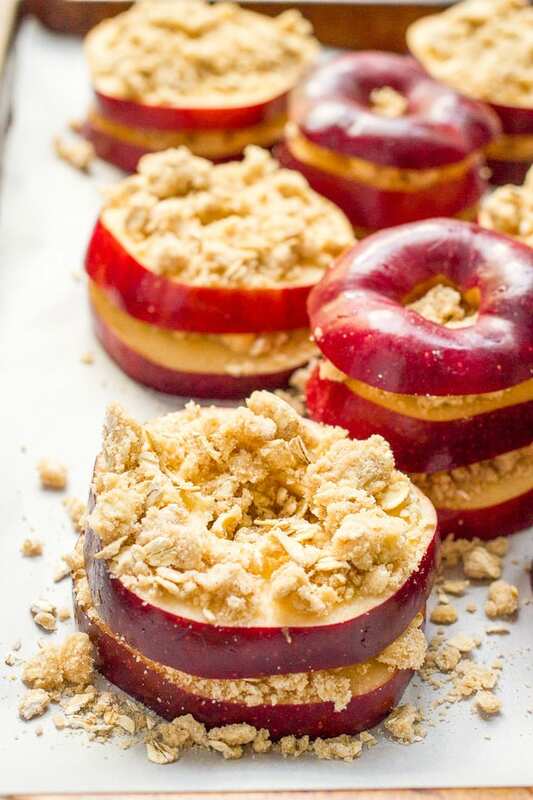 Easy healthy apple crisp stacks. It’s kind-of like a stacked up crustless apple pie. It’s kind-of like a deconstructed apple crisp tower. 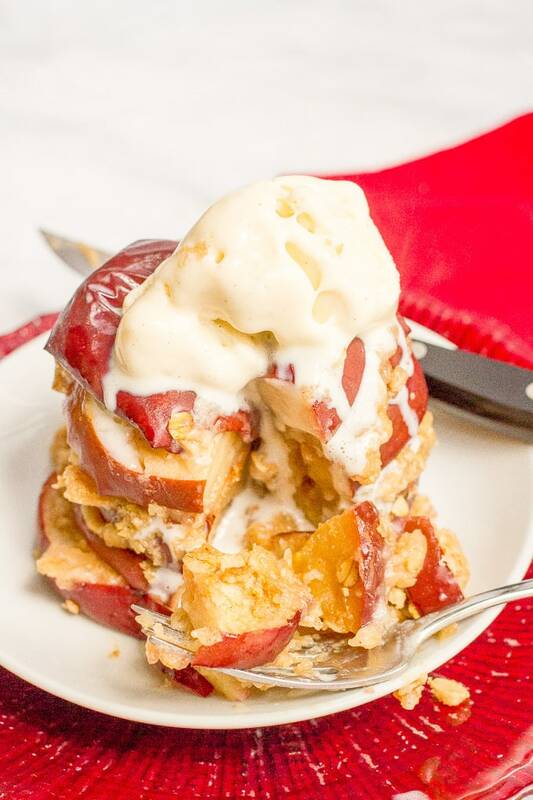 It’s kind-of like a skinny version of baked apples, made a little crazy. And it’s kind-of like delicious. And so quick and easy! And when I’m feeling really indulgent? I just stack them higher and dig in! I use a sharp knife and slice right through the core. Then I remove the inner circle. See the video above for a visual. I make my slices a hefty 1/4-inch thick. They get completely cooked through in the oven but still hold their basic shape to be able to stack them up. 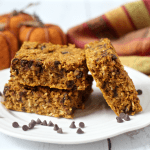 I’m white whole wheat flour kinda gal, but you can use regular all-purpose flour or substitute a gluten-free flour blend to make this a gluten-free recipe. 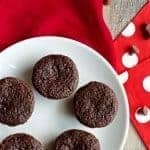 You can make these vegan! Just substitute a vegan butter. (Make sure it’s cold and hard – freeze it if necessary.) You could try this with coconut oil but I haven’t tested that and can’t vouch for it. I’ve used Gala and Red Delicious apples before and both work great. Any baking apple would be fine here. You can easily halve the recipe or just use one apple and 1/4 of the streusel mixture for a smaller batch. I hope you’ll join me in this new-found apple fun. 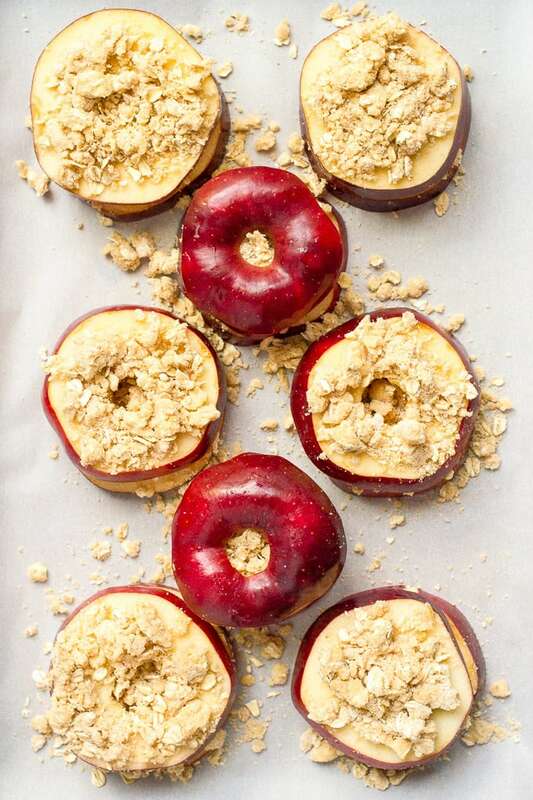 Stacked apple pie, baked apple slices, easy healthy apple crisp stacks – whatever you want to call it, it’s a must-have for fall. 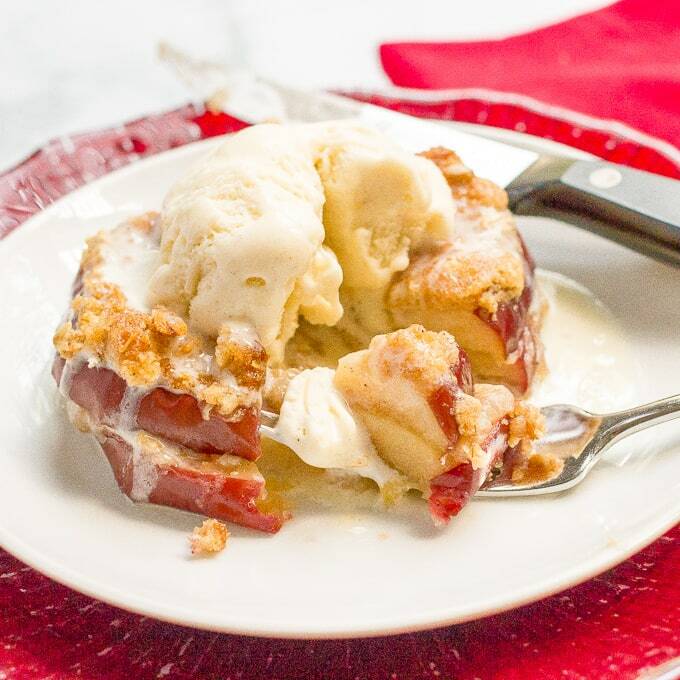 This quick and easy healthy apple crisp recipe is a fun twist on a dessert favorite! To make the streusel, combine flour, oats, sugars, cinnamon and salt in a medium bowl. Add cold butter pieces and use a pastry cutter or two knives to cut in butter until it’s well incorporated and the mixture resembles small crumbles. Place half of the apple slices on the baking sheets. Top each slice with 1 tablespoon of the streusel mixture. 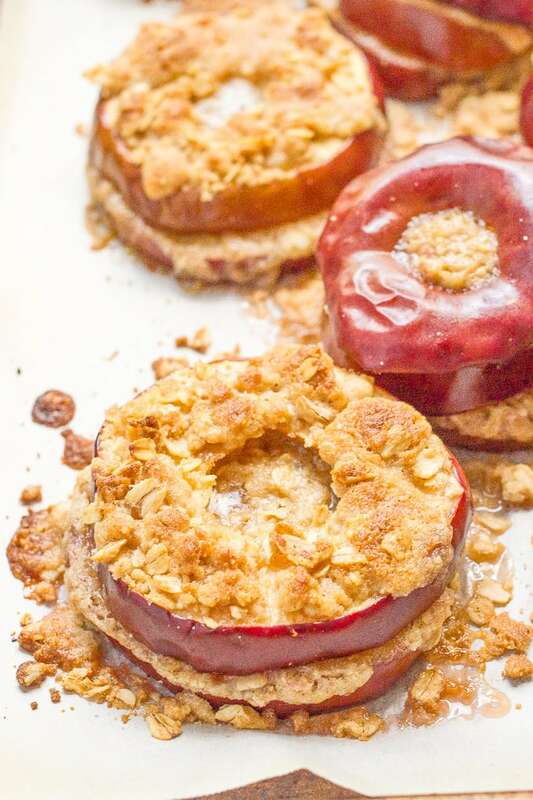 Place the remaining apple slices on top of the first one and top with another tablespoon of streusel mixture. 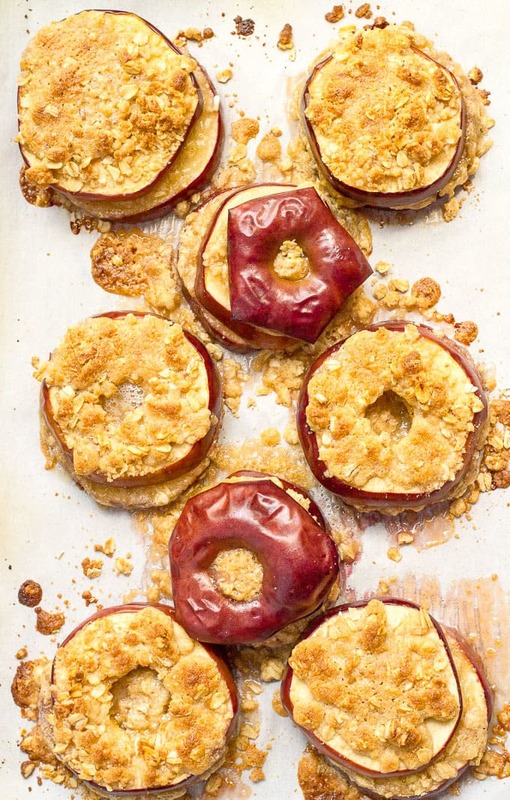 Bake at 375 for 20-25 minutes, until apples are tender and the streusel is lightly browned. 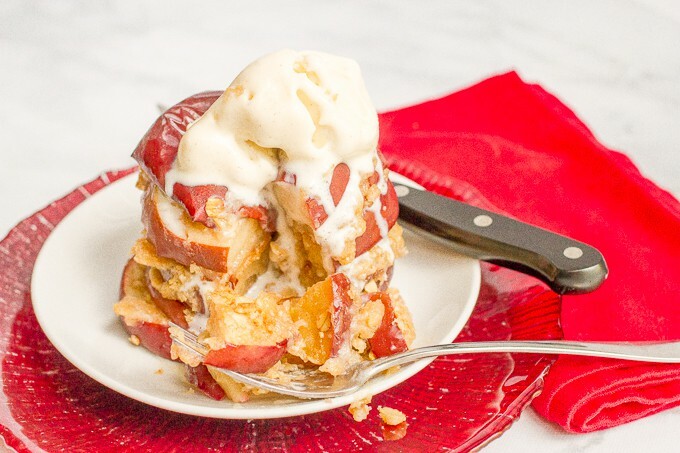 Stack up the apple layers as high as you like, top with ice cream and enjoy! 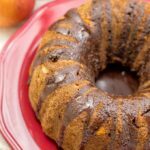 I use white whole wheat flour, but you can use regular all-purpose or substitute a gluten-free flour blend. I’m not a pie person…period. 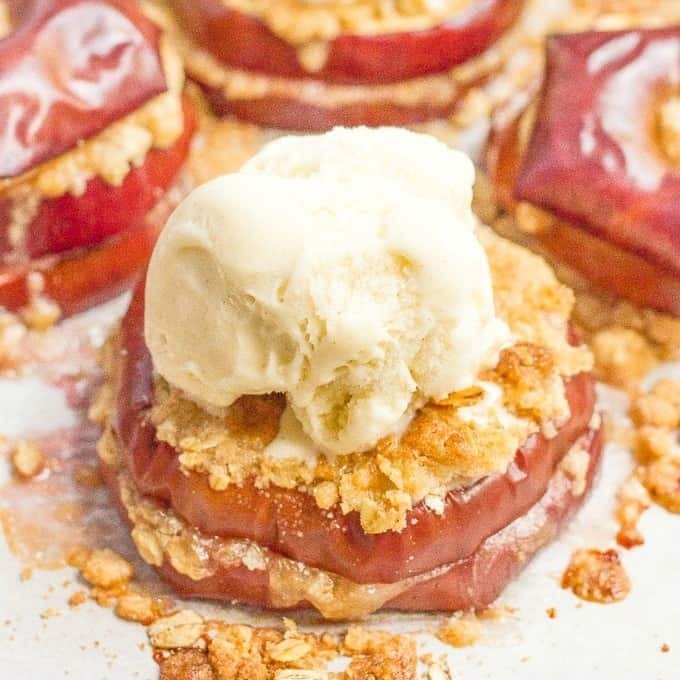 But these FUN stacked apple crisps!? 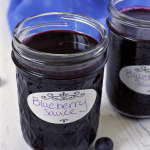 O my goodness, such an awesome DELICIOUS idea! Right?! It’s similar but aso so different and all kinds of delicious this way! What a great idea!!! Love stacking anything and everything! Such an original dessert. It looks so delicious! Beautiful and undoubtedly delicious! I love how you can see the red peel of the apple – not to mention the extra fiber you get from eating the peel.